Yesterday I did a double take when I saw the following in my RSS reader. I tend to skim quickly through RSS stuff, but this article definitely caught my attention. Why did it catch my attention? Well, because I used to work for NexTec. I owe a lot to the good people at NexTec. Before working there, I had no idea what ERP even was. While at NexTec, I learned a lot about ERP and realized that I wanted to focus my career on it. The owners and consultants there spent a lot of time with me and I sucked as much knowledge out of them as I could. They were very patient, gracious, and provided a lot of insight. NexTec introduced me to blogging because all of us consultants took turns putting together a blog post on the company blog. Click here for a look at my first posts. Blogging introduced me to the ERP blogosphere and the near infinite amount of quality ERP information that is available on the internet. I have been hooked ever since and I continue to drink from the fire hose of information that dumps into my RSS reader every day. What does this mean for Acumatica? In my opinion, this is a HUGE win for Acumatica because they get a major player on the list of top 100 VARs. Bob Scott recently published his list of top mid market VARs which is called BSI: 2015 Top 100 VARS. The BSI: 2015 Top 100 VARS list is a list of the largest mid market VARs by revenue. NexTec sits at #29 on this list. The VARs on this list have been slowly adopting cloud products over the past few years. Yes, the cloud continues to have a major impact in the market. This year, a majority of firms, 55, carry at least one cloud product. That compares to 44 in 2014. However, the number is heavily concentrated in the second half of the list. Thirteen of the last 20 firms carry cloud products while only eight of the top 20 do. So what’s the deal with the top 20? The larger firms do more thorough research. The ERP market has been undergoing dramatic changes in the last 5 years and taking on a new product is a major endeavor for VARs. You can be sure that the larger firms especially are going to do thorough research before pulling the trigger on a new product. I know the people at NexTec. I know that they are very smart and that they perform exhaustive research before making a decision of this magnitude. That’s another reason why the NexTec announcement is such good news for Acumatica. You can be sure that NexTec would have also reviewed NetSuite and Intacct as anyone would these days. The fact that NexTec chose to go with Acumatica says a lot about Acumatica. Dynamics AX messes up the rankings. 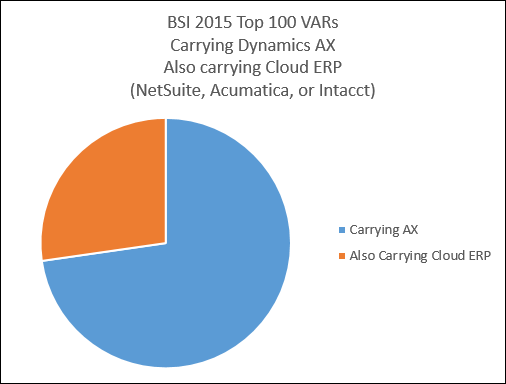 Dynamics AX messes up the BSI: 2015 Top 100 VARS rankings in my opinion. Dynamics AX is not a mid market product. Even Panorama Consulting Solutions, widely respected for their ERP expertise, acknowledges this by including Dynamics AX together with SAP and Oracle in this annual Clash of the Titans report. 33 of the 100 in the BSI: 2015 Top 100 VARS carry Dynamics. In fact, the top 10 is made up entirely of Dynamics AX VARs. And only 9 of the 33 carry one of the major cloud products (NetSuite, Intacct, or Acumatica). 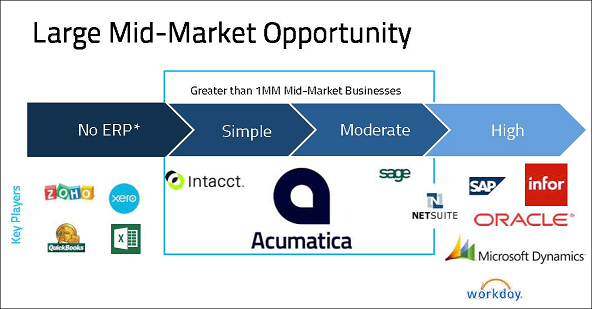 This isn’t a surprise because Dynamics AX is really its own world, focused on multi-billion dollar companies, not the mid market that Acumatica is focused on. So, if we remove all the Dynamics AX VARs from the list, then we are left with 67 top VARs instead of 100, which makes the addition of NexTec at #29 stand out even more as a big win for Acumatica. Things get more interesting with Sage X3. There are 13 VARs on the BSI: 2015 Top 100 VARS ranking that carry Sage X3 and 9 of them have already picked up one of the major cloud products (8 on the BSI: 2015 Top 100 VARS report plus NexTec). Is this poor reflection on Sage? I’m not sure, but I think it’s interesting. I think it’s important to keep this graphic in mind when looking at which Cloud ERP products get picked up by the larger VARs in the next few years. The larger VARs (excluding the Dynamics AX ones) all tend to have a portfolio of products, not just one product. So, the Cloud ERP product that they choose will be widely influenced by where they want to position it in their existing portfolio. But, regardless of what influenced NexTec’s decision, it is definitely very good news for Acumatica.